Power Manager is easy to remove. 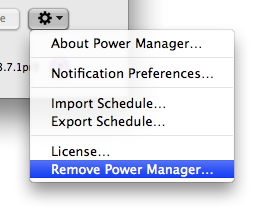 Select Remove Power Manager… in the Action (cog) menu of the Power Manager System Preference. You must have administrator rights to remove Power Manager. A restart is required after removal.